Below you fill find all funeral homes and cemeteries in or near Ligonier. 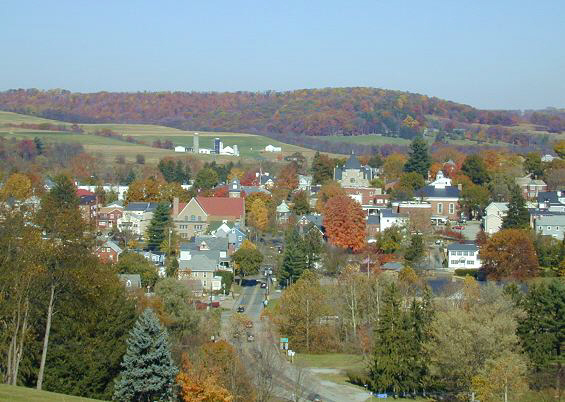 Ligonier is also known as: Westmoreland County / Ligonier borough. Zip codes in the city: 15658. Some of the notable people born here have been: (charley bowser). Ligonier is a borough in Westmoreland County, Pennsylvania, United States. The population was 1,573 at the 2010 census. Ligonier was settled in the 1760s. The borough is well known for nearby Idlewild Park, one of the oldest amusement parks in the country, and nearby Seven Springs Mountain Resort. Another tourist attraction is Fort Ligonier Days, a parade and craft market that takes place every fall over the course of three days. Ligonier is part of the Pittsburgh Metropolitan Statistical Area.Ligonier is the site of a reconstruction of Fort Ligonier, an example of a frontier fort of the French and Indian War. Ligonier is also known for its downtown square, the Diamond, which has a bandstand in the middle. It was reported on November 19th, 2018 that Marie Barrett (Kenney) perished in St Petersburg, Florida. Ms. Barrett was 86 years old and was born in Ligonier, PA. Send flowers to express your sorrow and honor Marie's life. It was reported by Johnstown Tribune-Democrat on July 31st, 2016 that Karl Stewart Col Park passed on in Ligonier, Pennsylvania. Park was 85 years old. Send flowers to express your sorrow and honor Karl Stewart Col's life. It was revealed by Johnstown Tribune-Democrat on June 9th, 2016 that Charles R Capt Brun passed on in Ligonier, Pennsylvania. Brun was 76 years old and was born in Washington, DC. Send flowers to share your condolences and honor Charles R Capt's life. It was written by Johnstown Tribune-Democrat on May 19th, 2016 that Bernice M Will (Daniels) died in Ligonier, Pennsylvania. Ms. Will was 79 years old. Send flowers to express your sympathy and honor Bernice M's life. It was noted by Johnstown Tribune-Democrat on May 1st, 2016 that Ruth A Sager (Rankin) perished in Ligonier, Pennsylvania. Ms. Sager was 95 years old. Send flowers to share your condolences and honor Ruth A's life. It was noted by The Daily Tribune on February 17th, 2016 that Audrey Lee Cowles (Auman) passed away in Royal Oak, Michigan. Ms. Cowles was 80 years old and was born in Ligonier, PA. Send flowers to express your sorrow and honor Audrey Lee's life. It was revealed by Star Beacon on February 11th, 2016 that William H Readshaw perished in Sebring, Ohio. Readshaw was 93 years old and was born in Ligonier, PA. Send flowers to express your sympathy and honor William H's life. It was noted by Canon City Daily Record on February 12th, 2015 that Lois Smith (Nicely) perished in Canon City, Colorado. Ms. Smith was 92 years old and was born in Ligonier, PA. Send flowers to share your condolences and honor Lois's life. It was noted by Johnstown Tribune-Democrat on January 10th, 2015 that Wayne T Friedline perished in Ligonier, Pennsylvania. Friedline was 91 years old. Send flowers to express your sorrow and honor Wayne T's life. It was noted by Johnstown Tribune-Democrat on August 2nd, 2014 that Joylene H Whipkey (Ream) perished in Ligonier, Pennsylvania. Ms. Whipkey was 83 years old. Send flowers to express your sympathy and honor Joylene H's life. It was an enormous army, a virtual moving city of 6,000 people, that temporarily made this the most populated spot in Pennsylvania second only to Philadelphia. Several decades of prosperity followed. Eventually, the name of the settlement that grew up around the fort was shortened to Ligonier. The borough is well known for nearby Idlewild Park, one of the oldest amusement parks in the country, and nearby Seven Springs Mountain Resort. In 1909-1910, the Ligonier Valley Railroad built an ornate station and headquarters building, which still stands at 339 West Main Street. The official website for the city of Ligonier is https://ligonier.com/. my brother, Henry, supports the Humane Society of Western Pennsylvania, and my brother ... Arrangements are under the care of the J. Paul McCracken Funeral Chapel and Crematory, Ligonier. Shirley Funeral Home Inc. in North Huntingdon. Ligonier Borough police are still investigating ... 708 Route 119, Greensburg, PA 15601. Listing all funeral homes in Ligonier, Pennsylvania so you can easily send flowers to any location (same day delivery) or find any funeral service. Listing all cemeteries in Ligonier, Pennsylvania so you can easily send flowers to any location (same day delivery) or find any funeral service. We work with local florists and flower shops to offer same day delivery. You will find budget sympathy flowers in Ligonier here. Our funeral flowers are cheap in price but not in value.